I have been craving some grilled food for a while. But my waist-line will not take kindly to anything greasy so I went and bought myself a bunch of juicy peaches, nectarines and bright red strawberries and decided to make myself a huge bowl of fruity grilled goodness. I know the weather is dreary and not really right for starting up a barbeque so it is a relief that I can still get great results with a good griddle pan. Perfect for testing out my new cast aluminium grill pan then? 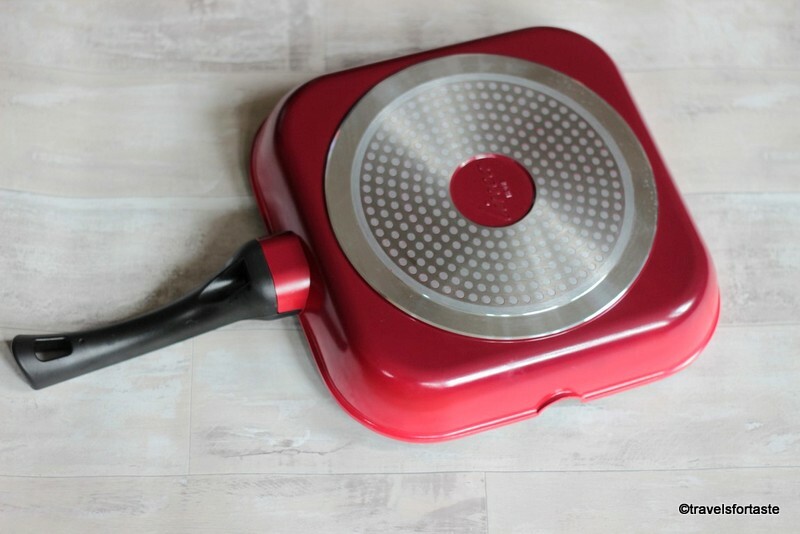 I really like the colour combination of red and black and because this cast aluminium grill pan is from the ultra-light cookware range by House of Fraser it is so much easier use especially to flip pancakes in! I was also a bit worried that now that I am in a new house and my new kitchen has electric hobs ( I so miss the gas hob! sob sob…) how things would turn out but the grill pan works on electric hobs just as fine as well as solid hot plates, gas, ceramic hobs, halogen and induction – so versatile. 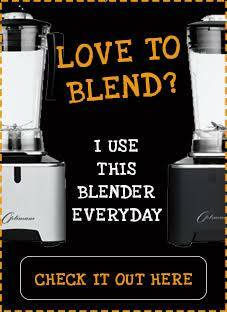 The best part is that it has a little groove on the side where your wooden or plastic spatula can rest – very handy. As it was the first time I was using the grill pan, it needed to be washed with warm soapy water before-hand and left to air dry. Also, the pan works best on the hob that matches the size of the pan. Chop the fruit into large kebab sized pieces. Allow the pan to heat for 2 minutes so that it is the right temperature - this may not be required on a gas flame hob. 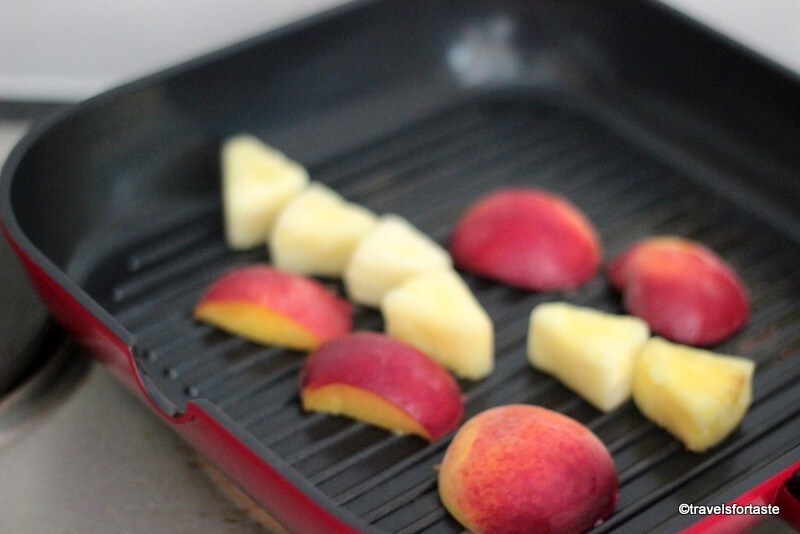 Carefully place the fruit pieces on the pan and gently press down with a wooden spatula. This ensures that the fruit will not bruise too much but also will ensure that the soft flesh touches the hot ridges to give it the trademark grilled effect. Allow for about 2 -3 minutes, about 1.5 minutes each side on high heat but check by flipping over gently. The softer fruit especially the peaches and kiwi will take lesser time on the pan while the pineapple and banana will take longer. Sprinkle some sea salt over the fruit. After the fruit has dry roasted on each side transfer to a plate and set aside. Remove the pan from the hob and move to a rivet or a cooling down and allow it to come down to room temperature. In a small pan over low heat, add the honey and some water to dilute give the mixture a little, mix the smoked paprika powder as per taste and immediately take it off the heat. Pour the lime juice in and the add the chopped mint leaves, mix well. 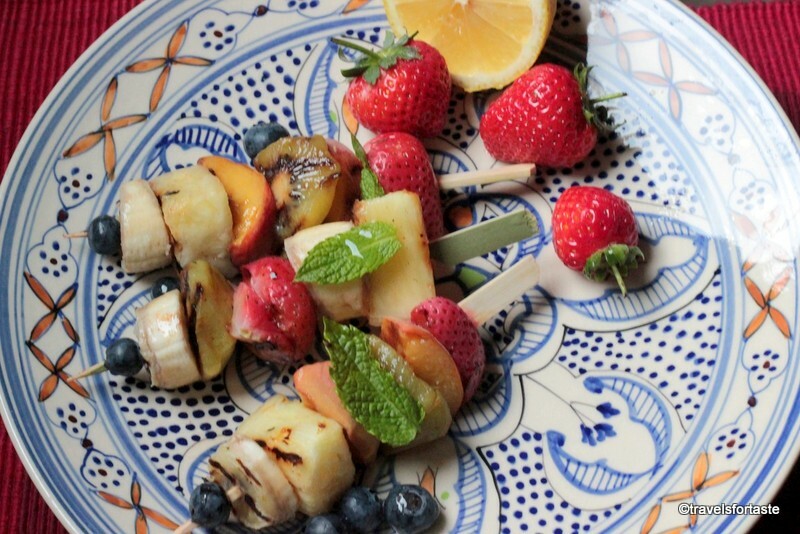 Alternating between pineapple, kiwi, strawberry and peach cubes gently thread the grilled fruit onto the skewers. I like the little wooden skewers which makes it easier to eat them as well. 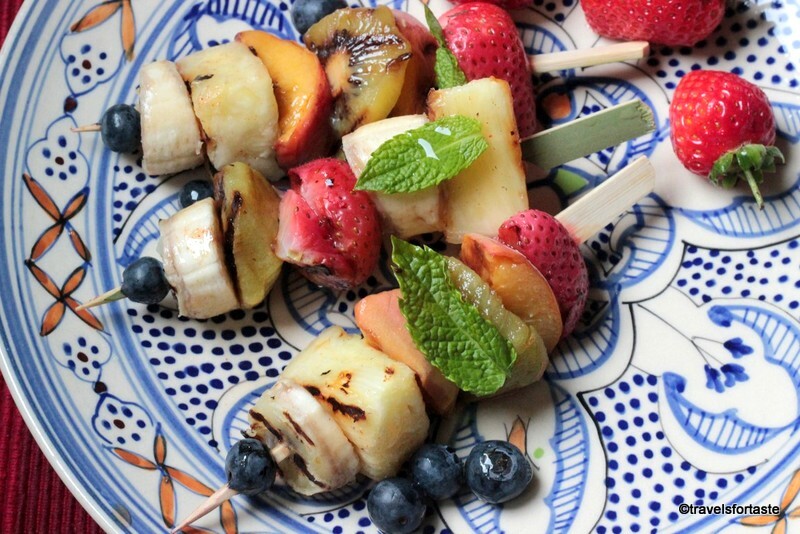 Add a blueberry at the end of each skewer for visual effect. Pour the tangy honey drizzle onto the grilled fruit and garnish with some finely chopped fresh mint leaves for a fresh and light taste. Squeeze some more lemon juice on top before serving. 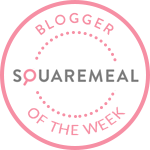 *With thanks to House of Fraser for sending me a Linea Cast Aluminium Grill Pan 28cm for review. As usual all opinions expressed here are entirely my own.